Compact gold tipped connections offer the best possible conductivity and connection for data and charging. Fits easily and securely into your device, while fitting most cases. 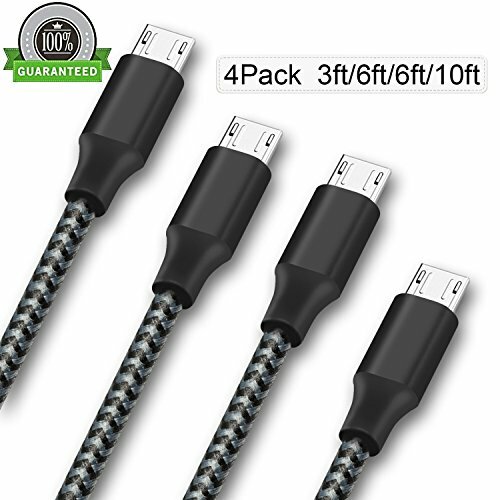 Thick durable cables made to last a lifetime and charge at the quickest possible speed. Charge at the fastest possible speed with Quick Charge 2.0 capable micro usb cables. this is also known as rapid charge. All cables included in the pack are capable of rapid charging technology allowing up to 75% faster charge over other cables. 1.Log into your account on Amazon.com, click "Your Account", and then click "Your Orders". 2.Click on the specific product you purchased from us, and select the "Contact seller". 3.Provide the order number and pictures, We will provide you new replacement. Strong & Durable Cable: micro USB cable with aluminum alloy nylon braided increases the higher durability and flexibility to prevent against damage to the cable. Fast Charging & Syncing: Sync and Charge simultaneously at fast speeds on your Micro USB compatible devices. Save your precious time from the fast pace of life! Universal Compatibility - Support most Android Tablets, Cell Phones.Compatible with Samsung Note 4/5, Galaxy S3/S4/S6 Edge S7, HTC, Motorola, Nexus, Nokia, LG, HP, Sony, Blackberry, MP3 and other Micro USB compatible devices. Diverse length: 3FT,6FT,6FT,10FT different length for using on sofa, in bed, in car and some other places. The bundles of the micro USB cable make your life more convenient. Service and warranty: worry-free 12-month warranty and friendly customer service. If you have any queStions, don't hesitate to contact us! If you have any questions about this product by QRGYS, contact us by completing and submitting the form below. If you are looking for a specif part number, please include it with your message.